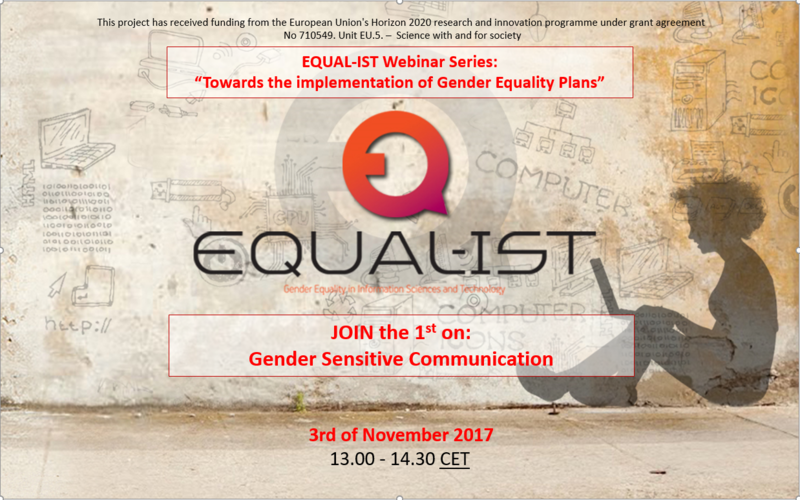 The EQUAL-IST Team invites you to participate in the first Webinar titled: “Gender Sensitive Communication”, of the four EQUAL-IST Webinars series: “Towards the implementation of Gender Equality Plans”. The Webinar is about “Gender Sensitive Communication” and there are going to be presentations on “Gender, language, empowerment” by Giuliana Giusti, Professor of Linguistics at the University Ca’ Foscari of Venice and on the “Available tools for promoting gender sensitive communication”, by Maria Sangiuliano, Research Fellow at Università Ca’ Foscari of Venice – Department of Computer Sciences. After the presentations, Q&As and a knowledge sharing session are going to take place as well. All you need is a stable internet connection and a headset. Interested? Then, click here and Join the Webinar! The webinars are open accessed and anyone can attend, watch and participate. However, we have to mention that there are going to be limited online open seats, so you will have to log in at least 10 minutes before the beginning of the Webinar and make sure that you will not log out during the webinar, since it is highly possible your online seat to be taken by another attendant. This presentation will provide insights on how linguistic structures are formed by gender bias: drawing mostly on examples from English and Italian. In General, it will explore the multiple ways in which language interacts with the construction of gender identity since linguistic meta – competences can enhance language use in an equal opportunity perspective. For Research Organizations interested into promoting internal structural change and make their Institutional Communication gender sensitive, it is important to take stock of existing available tools and guidelines. The presentation will focus among others on the UNESCO Gender and Media Guidelines, the UNDP Principles on Gender Sensitive Communication and the Antwerp Chart on Gender Sensitive Communication in and by Academic Institutions from the H2020 Project. Reflections on how these guidelines can be applied to ICT-IST research organizations will also be shared. Giuliana Giusti, is Professor of Linguistics at the University Ca’ Foscari of Venice, where she has been the president of the Equal Opportunity Committee. Her principal research interests lie in the field of comparative linguistics of Germanic, Romance, and Balkan languages, to enhance linguistic awareness and support language learning in an innovative perspective. She has been researching and teaching extensively on Gender and Language issue, among others delivering the first teachers’ training course promoted by UNIVE within a FSE -EQUAL project in 2007 and more recently in 2016/2017 a dedicated MOOC (Massive Online Open Course) on Gender and Linguistics. Maria Sangiuliano is Research Fellow at Università Ca’ Foscari- Department of Computer Sciences. She is the Senior gender researcher in charge of supporting the EQUAL-IST project partners in successfully designing and implementing their Gender Equality Plans. Maria has a PhD in Cognitive and Learning Studies and 15+ years of experience in research and project management within EU funded projects on mainstreaming gender in innovation policies and programs. You can participate in the webinar from anywhere in the world. All you need is a stable internet connection and a headset. Interested? Then click here and Join our Webinar. A recording will be available after the webinar in case you miss anything or you are unable to participate.